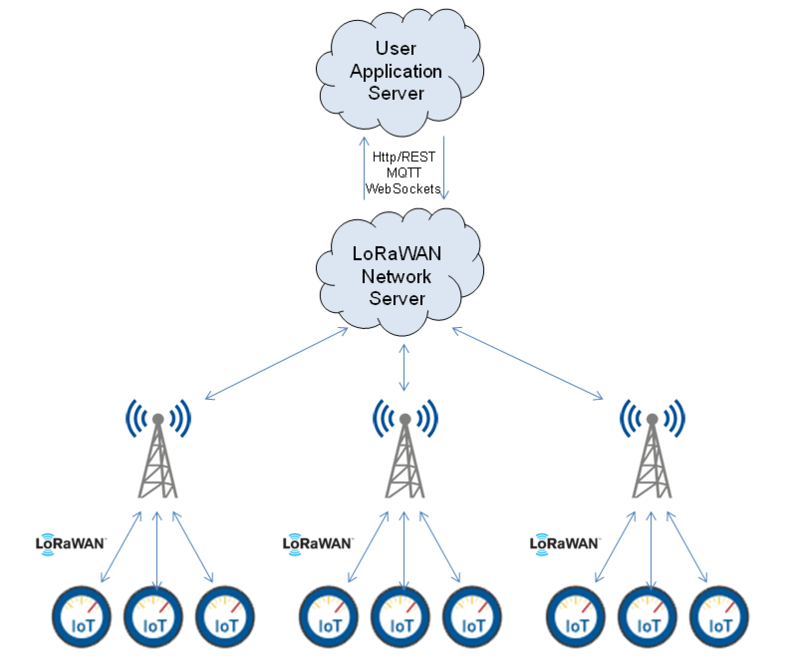 LoRaWAN (Long Range Wide Area Network ) is designed to allow low-powered devices to communicate with Internet-connected applications over long range wireless connections. IoT devices connect with LoRaWAN enabled Gateways that forward information to a Network Server. Network Server can in turn provide that information to User Application Servers. Companies such as Senet (http://www.senetco.com), LORIOT(http://www.loriot.io), Comcast' MachineQ (http://www.machineq.com) and others operate carrier-grade LoRaWAN networks in North America, Europe and Asia and allow IoT devices to connect with their gateways. Information from IoT devices is then aggregated at their Network Servers and APIs are available for User Application Servers to interface with them. Providers of IoT application software world-wide, that leverage LoRAWAN networks to create their own Application Server software, need to demonstrate their solution as well as conduct performance, regression, stress and scalability testing in a controlled environment prior to actual deployment. Doing this with limited resources in a cost effective manner is a non-trivial task. This application note describes the use of SimpleSoft's SimpleIoTSimulator for just that purpose. A typical network architecture diagram is shown below. 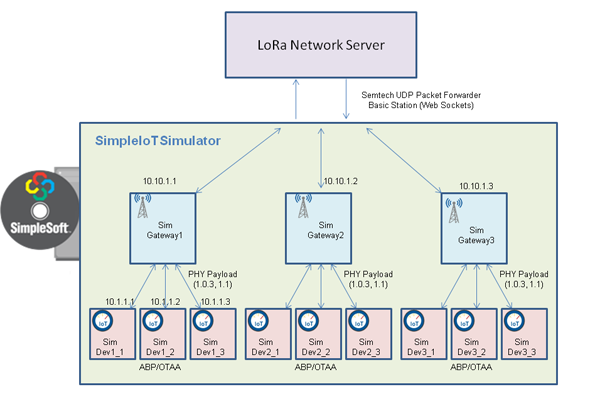 Using SimpleIoTSimulator, you can simulate LoRa gateways and sensors to test the LoRa Network Server as shown below. Internally, the SimpleIoTSimulator creates separate device contexts for LoRa sensors and LoRa gateways, so that each one of them can be individually controlled to create various test and demo scenarios. Both uplink data messages and downlink control messages are supported. A wizard interface that queries just for number of gateways, type and number of sensors can be used to quickly setup the simulator. The simulated LoRa devices support LoRaWAN 1.0.3 specification and support both OTAA and ABP activation methods. The modular architecture of the simulator allows Class A, B and C type LoRa devices sending different payloads to be modeled using scripts. Simulated LoRa devices send their LoRa PhyPayload frames over UDP to Gateways that encapsulate them into GWMP messages to send to designated Network Servers. Downstream messages from Network Servers received by the Gateway get forwarded to the associated LoRa device. You can use the simulator to quickly create large number of gateways and sensors for testing Network Servers. 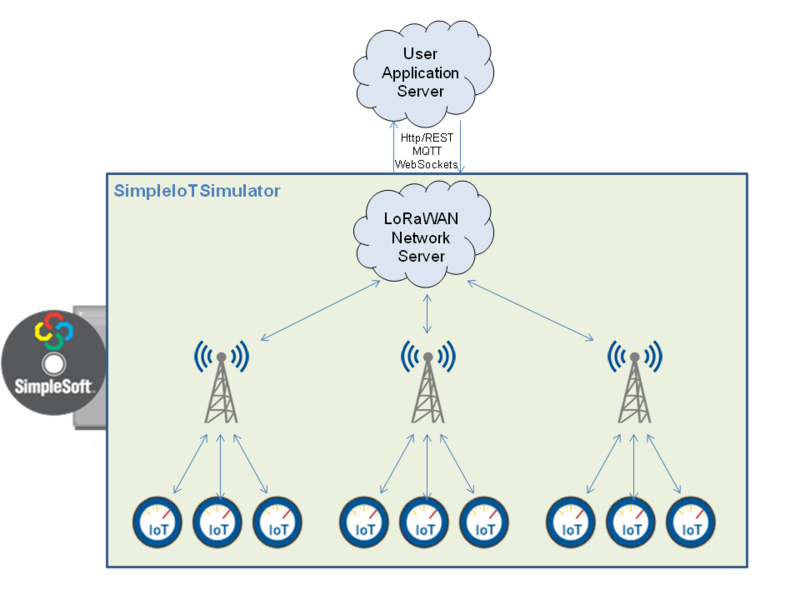 Using SimpleIoTSimulator, you can also simulate the entire LoRaWAN network including the Network Server component that interfaces with the User Application Server as shown below. Internally, the SimpleIoTSimulator creates separate device contexts for the sensors, gateways and the LoRaWAN Network Server, so that each one of them can be individually controlled to create various test and demo scenarios. Both uplink data messages and downlink control messages are supported. A wizard interface that queries just for number of gateways, type and number of sensors, and type of API can be used to quickly setup the simulator. The modular architecture of the simulator allows Class A, B and C type LoRa devices to be modeled using scripts. Network Server APIs supporting HTTP/REST, MQTT, MQTT over websockets can also be similarly modeled. Sample scripts for some popular device types and Network Server APIs are available to use as templates. The simulation can then be used to create dynamic sales demos that demonstrate the value of the application software and convince the potential user of his return-on-investment, prior to actual deployment. Proof-of-Concept projects using the simulator can quickly transform into actual successful deployments. The simulation can also be used for functional and scalability testing, without needing large investment in test infrastructure. Test scenarios like large number of devices, receiving uplink messages at a rapid rate, clock drifts, loss of communication with devices, battery failures in devices, gateway failures, and bad API message formats can all be easily scripted to ensure robustness of the solution provided. Please contact SimpleSoft Inc. at sales@simplesoft.com to discuss your specific use case and to see a demonstration of this solution.